Comments: Broadleaf deciduous tree native to China. 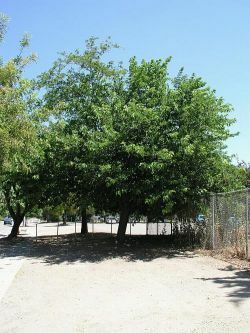 Imported to North America in colonial times as food for silkworms, this tree is a common street and shade tree. Green 3 lobed leaves 5" wide and 7" long, and a gray trunk. Many trees are crosses and hibrids of white, red and black (a native North American species) mulberry. Broad oval growth is the norm.